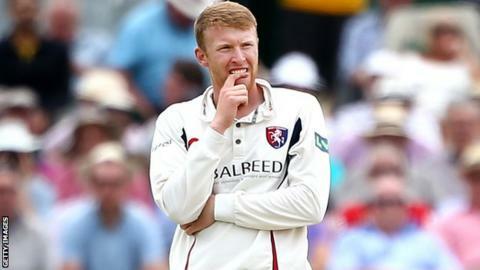 Kent spinner Adam Riley hopes he can move on from a "frustrating" 2015 after extending his contract with the club. The 23-year-old only made eight first-class appearances this year, taking eight wickets at an average of 53. "I've got this tag of having potential and I want to start fulfilling that now," he told BBC Radio Kent. "In 2016 my thought process should be to start anew. I'm determined to work hard over the winter and hit the ground running in pre-season." Sidcup-born Riley had an impressive 2014 campaign for Kent, taking 48 Championship wickets at an average of 32.58 and ending the year with a call-up to the England Lions. "Last winter was a great experience for me and one which will stand me in good stead, being in a new environment with new coaches," Riley added. "2015 was very frustrating but there are more lessons to be learnt than the year before." Riley says the pitches in Division Two this year were not conducive to spin bowlers. "There have been some pitches that have not warranted bowling spin at all, which has not been the way in county cricket down the years," he said. "People talk about how the spin cupboard is bare in England - and these pitches do no favours to developing the young up-and-coming spinners. "I think the people higher up have got feedback from various captains and coaches that the pitches went a bit too far in favour of the seam bowlers. "Maybe it was just a freak year and it will go back to some more spin-friendly wickets after the first couple of months. We can only bowl on the wickets we are provided with."